I recently learned an interesting fact about Fibonacci numbers while watching a random number theory video on YouTube. Fibonacci numbers can be used to approximately convert from miles to kilometers and back. Take two consecutive Fibonacci numbers, for example 5 and 8. And you're done converting. No kidding – there are 8 kilometers in 5 miles. To convert back just read the result from the other end – there are 5 miles in 8 km! But that's not all – if you need to convert a number that is not a Fibonacci number, just express the original number as a sum of Fibonacci numbers and do the conversion for each Fibonacci number separately. For example, how many kilometers are there in 100 miles? Number 100 can be expressed as a sum of Fibonacci numbers 89 + 8 + 3. Now, the Fibonacci number following 89 is 144, the Fibonacci number following 8 is 13 and the Fibonacci number following 3 is 5. Therefore the answer is 144 + 13 + 5 = 162 kilometers in 100 miles. This is within 1% of the precise answer, which is 160.93 km. Another example, how many miles are there in 400 km? Well, 400 is 377 + 21 + 2. Since we are going the opposite way now from miles to km, we need the preceding Fibonacci numbers. They are 233, 13 and 1. Therefore there are 233 + 13 + 1 = 247 miles in 400 km. Again super close – the correct answer is 248.55 miles. Just remember that if you need to convert from km to miles, you need to find the preceding Fibonacci number. But if you need to convert from miles to km, you need the subsequent Fibonacci number. If the distance you're converting can be expressed as a single Fibonacci number, then for numbers greater than 21 the error is always around 0.5%. If the distance needs to be composed as a sum of n Fibonacci numbers, then the error will be around sqrt(n)·0.5%. Fibonacci numbers have a property that the ratio of two consecutive numbers approaches the Golden ratio as numbers get bigger and bigger. 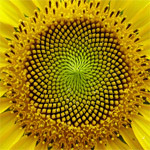 The Golden ratio is a constant that happens to be approximately 1.618. Coincidentally, there are 1.609 kilometers in a mile, which is within 0.5% of the Golden ratio. Now that we know these two key facts, we can figure out how to do the conversion. If we take two consecutive Fibonacci numbers, Fn+1 and Fn, we know that their ratio Fn+1/Fn is approximately 1.618. Since the ratio is also almost the same as kilometers per mile, we can write Fn+1/Fn = [mile]/[km]. It follows that Fn·[mile] = Fn+1·[km], which translates to English as "n-th Fibonacci number in miles is the same as (n+1)-th Fibonacci number in kilometers". That's all there is to it. A pure coincidence that the Golden ratio is almost the same as kilometers in a mile.